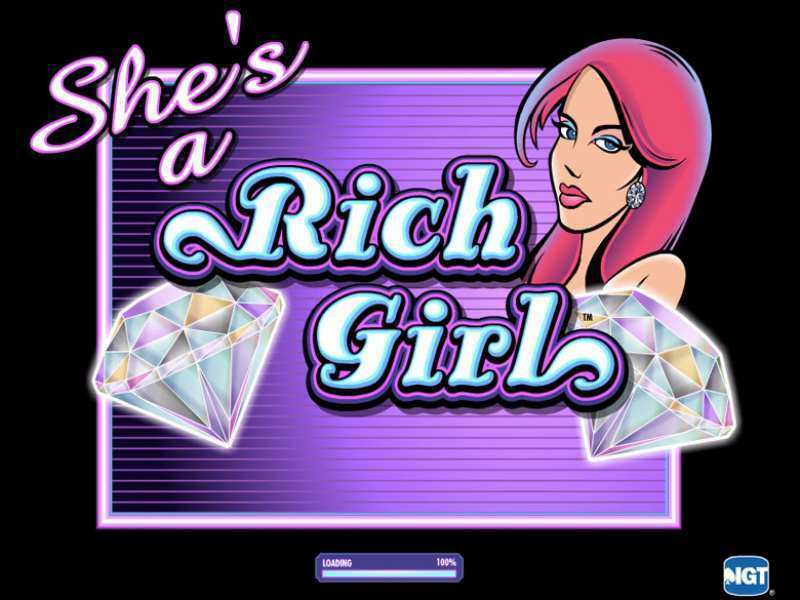 She's a Rich Girl by IGT is like a fun trial run of the lifestyle of the rich and the famous with a funky pink-haired protagonist and her pampered pet for company. The game is a simultaneous quest for diamonds by the 'Rich Girl' and Dan, her boyfriend. So if you want to enjoy an afternoon of leisure and delve into a world of diamonds and glitterati, your best bet is She's a Rich Girl Slots, a free online game designed to keep you engaged and on the edge. There are also some pretty good wins on the line, achievable with practice. The symbols in the game include The rich girl, her dog, her boyfriend Dan, her cat, and also an array of fruits such as cherries, plums, peaches, lemons, and watermelons. The Scatter Symbol is represented by a set of gems and this also acts as a multiplier! The ‘Rich Girl’ is a potent Wild symbol and it doubles the player’s winnings when it is used to substitute a symbol in a winning combination. The Automatic Spin function allows one to choose between 10-50 automatic spins without having to repeatedly click the Spin icon. Free spins can only be activated if a player lands 3 or more of the Diamond logos on reels 2, 3 and 4. This gives the player 3 spins which could increase further in the course of the game. Diamonds are the most important Symbols in the game, both literally and figuratively. They’re even woven into the storyline! Diamonds are Wild Symbols in the game and using 1 or more of them to substitute symbols in a winning combination in the game leads to a doubling of the win amount. She’s a Rich Girl online offers quite a few ways to increase your winnings and get some real money. This is a feature that is triggered by the Free Spins feature. A player must land at least 3 Diamond Run logos on reels 4, 3 and 2 respectively. This leads the player to the next stage where he or she has 3 Free Spins completely comprised of various multi-colored jewels. Landing more Diamond Run logos gives more free spins, accumulating up to a 100! The player’s end reward is doubled also if their winning combination includes a Diamond Run logo. Another bonus element is the Rich Girl Wild Symbol: it being in a player’s winning combination doubles once again, their rewards. The Diamonds of 3 colors – Purple, Green, and Yellow are Scatter symbols. Finding any 3 triple the player’s stake, Finding any 4 multiplies it by 10 times and finding any 5 multiplies the total stake by an astonishing 25 times! The highest the scatter win is duly awarded. The Rich Girl Symbol has yet another bonus feature where 5 in a line can potentially win a player a 10,000 Coin Jackpot. Other interesting features of the game include little cartoon snippets into the lives of the game’s main characters like the one of Dan, hoping to impress his girlfriend with Diamonds! They add an element of fun to the game, livening up the action and making the backstory convincing. The graphics are somewhat rudimentary but are quite animated and the character build up adds an interesting angle to this no download online game, set in the UK. The Score is peppy, keeping pace with the racy action of the game. The simple 9 Paylines method combined with the wide coin range makes She’s a Rich Girl a game suited to both low and high limit slot players. So one can play free She’s a Rich Girl online casino game to experience the luxury of the idle rich and soak in the raining diamonds. The attractive and ingenious animation makes this online game a charming if somewhat less challenging one. The possible payouts are high, making this a popular choice for the gaming community. 0 responses to "She’s a Rich Girl Slot"